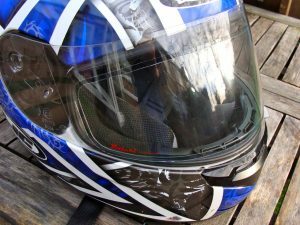 If you’ve ridden in the cold or wet you will know full well how big an issue a steamed up visor is. A whole cottage industry has grown up around this issue, with the Raleri FogStop being one such solution. Raleri kindly sent some of their products in for review, but I shall endeavour to keep this review honest. The FogStop works in a similar fashion to the popular Pinlock, in that it’s a secondary internal visor providing a double glazed setup to prevent your breath condensing on the cold exterior visor. I’m going to compare against the Pinlock a lot, as it does cover a huge chunk of market and is more commonly available and known. The FogStop inserts fundamentally differs in that no specialist visor with specific pins is required, it simply has adhesive edging to stick straight onto the visor. Great if your visor isn’t Pinlock ready or isn’t available for your lid (e.g. my Bell M3R). Oh and the FogStop is cheaper too. Not really a yellow tint, just the protective film! The Raleri FogStop inserts come in three sizes – standard (94mm high), small/race (80mm high) and an Arai specific shaped one. They’re also available in clear, dark, hi-def, mirror, metal and photochromatic (PCShade) finishes. The basic clear insert starts at €19, basic colours €22, Photochromatic €29 and the mirror/metal finish are around €40. Compare that to Pinlock’s that tend to start at £20 (photochromatic Pinlock are around £40) and may require purchasing a new visor too if you don’t already have a compatible one. 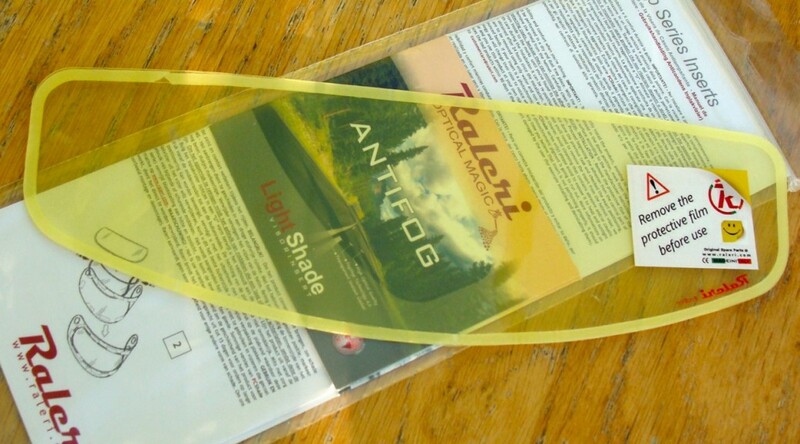 For this review, Raleri supplied a basic clear FogStop and a PCShade FogStop in standard and small sizes. The latter fit my Bell M3R helmet with its narrow view port, the former I installed on my wife’s HJC and daughters Caberg helmets. Installation was a breeze: took me all of 10 minutes. Installation was a breeze: just give the visor a good clean inside and out with some mild detergent, place the FogStop insert over the outside and draw an outline around it with a non permanent pen, whip off the visor, peel off the backing from the insert and the adhesive edging, then carefully stick it on the inside of the visor starting from centre then smoothing outwards. Took me all of 10 minutes. 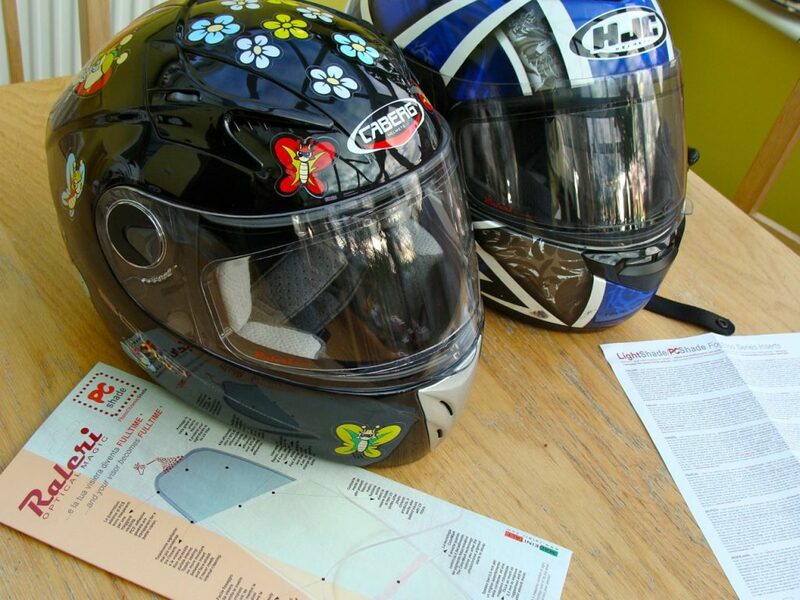 If your helmet is not Pinlock ready, then the FogStop inserts work out much cheaper and are a no-brainer choice. In use the FogStop’s prevents steaming up admirably, perfect visibility even on a chilly December ride whilst wrapped up in tonnes of layers. Both my wife and I really like the photochromatic PCShade visors, they darkened as needed reducing glare when needed. No more faffing about carrying sunglasses and swapping them as the sun appears suddenly low down in the sky as you round a corner. My daughter loved hers too, very happy about keeping her visor shut to keep warm and still able to see perfectly. The small size FogStop has really made my Bell helmet usable in the wet and cold. Clarity is good, though to be picky sometimes a slight distortion pattern can be noticed when looking into oncoming headlights. Very minor and only perceivable when you consciously look for it. The tinting reacts quickly and does a good job of blocking the sun, though in low light, it doesn’t go perfectly transparent, it remains ever so slightly tinted. It’s not enough to hinder night vision and only noticeable when you crack open the visor. So there you have it, a simple product that does exactly what it says on the tin and cheap too. If your helmet is not Pinlock ready, then the FogStop inserts work out much cheaper and are a no-brainer choice. What’s not to like about it? 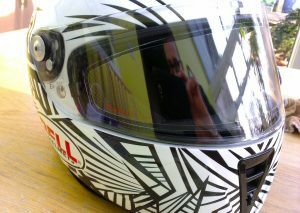 Well, one minor downside is there availability here in the UK, I could only find one retailer (Designer Helmets). Otherwise it’s ordering them direct from Italy, VAT and import duty are not an issue within the EU, but shipping time can be a downer. 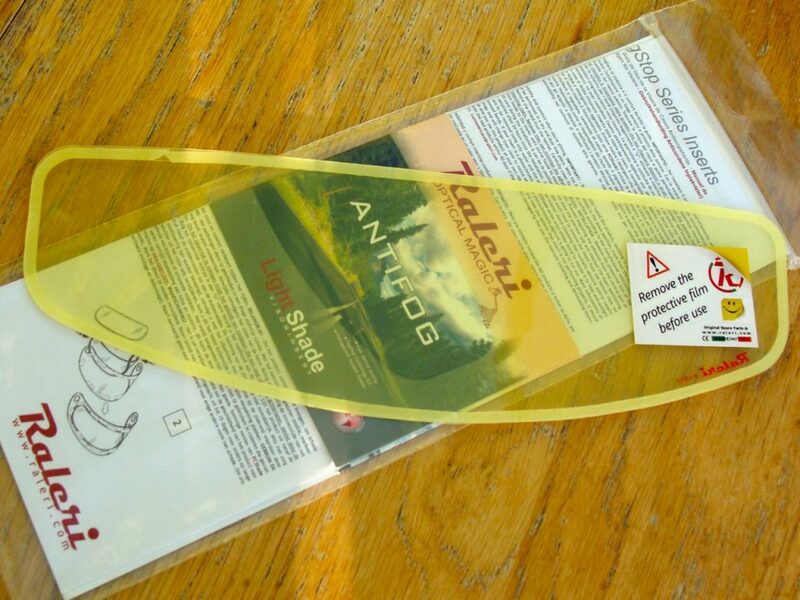 More details on the FogStop inserts here, where you can also purchase them direct from Raleri.